Today's final puppetry related post for this month includes a lot of YouTube videos along with a Public Domain selection. In attempting to stay puppetry related, the "Funeral March of the Marionette" by Charles Gounod popped into my head. at the Detroit Institute of Arts. I've never seen any stories about the Funeral March of the Marionette, but like many people the first thing the music triggered in my mind was the old 1955 to 1965 t.v. show, Alfred Hitchcock Presents. YouTube is loaded with videos related to that. Supposedly composer Bernard Herrmann suggested the piece to Hitchcock. Much as I enjoyed the great director stepping into his outline to Gounod's short composition, this time I really wanted a puppet, not a director who, like Andersen's "Puppet-Show Man", used actors as his puppets. YouTube had 3, well maybe 4, videos that came close. No information is given on this European version of Funeral March for a Marionette, but it is the only one showing actual marionettes moving through the video. It combines a small orchestral group with the show projected above the musicians. The marionettes are shown in actual European settings like an unnamed "Stadsmuseum" after leaving a puppet stage. The concept is interesting, but I didn't care for the musical performance's tinny arrangement. As a result the marionettes never really excited me even though I liked seeing people walking past them and the museum's display of toys where the "dead" marionette ended. Various types of hand puppets are more my personal style and Anzovin Studio's award winning computer generated animated film, Puppet, ends the way I'm sure my efforts with marionettes would. It's a humorous look at a puppeteer, Dennis the Dog, trying to control a rebellious puppet who looks like himself. The puppeteer's own personality also makes the ending just right. It's not a real puppet video, however, so on to yet another video. Again it's animated, but this time using puppets in Eric Fonseca’s stop motion Funeral March for a Marionette. It does a wonderful job of catching both the spirit of the music and fulfilling the title. Fonseca also is an award winner, in this case from the San Antonio Film Festival. Various interviews can also be found on YouTube explaining how stop motion filming the puppets required a year to produce the 6 minute film where “4 seconds on screen was about 4 hours in the garage.” Amazingly this was his first video. Learning from it he went on to create the 40 minute/4 year project, “Fall of the House of the Usher.” I find it interesting that everybody compares his artwork to that of Tim Burton's films. It's true, but for years I've noticed how Danny Elfman's music is a crucial element in Burton's final work. The Fonseca film throws down a gauntlet to puppeteers trying to do a live version. A workshop at the Motor City Puppet Blast on Friday, July 25, 11:45-12:45 by Larry Larson will be on “ Techniques of Stop Motion Puppet Construction” if this style of puppetry captures your interest. There's one other video I loved which uses Gounod's composition. Out of the Box takes the idea of a music box and reimagines the piece as ballet with a music box dancer learning to move. Since Gounod also wrote some great ballet music for his opera, Faust, I think he would accept this "marionette", too. Still I did promise this month to offer both puppetry related information and continue the Keeping the Public in Public Domain series of stories. Today is a very different type of story. It's a biographical look beyond the sometimes dry summaries found at Wikipedia. I enjoy telling biographical stories about people such as authors, artists, scientists, and, in this case, composers. 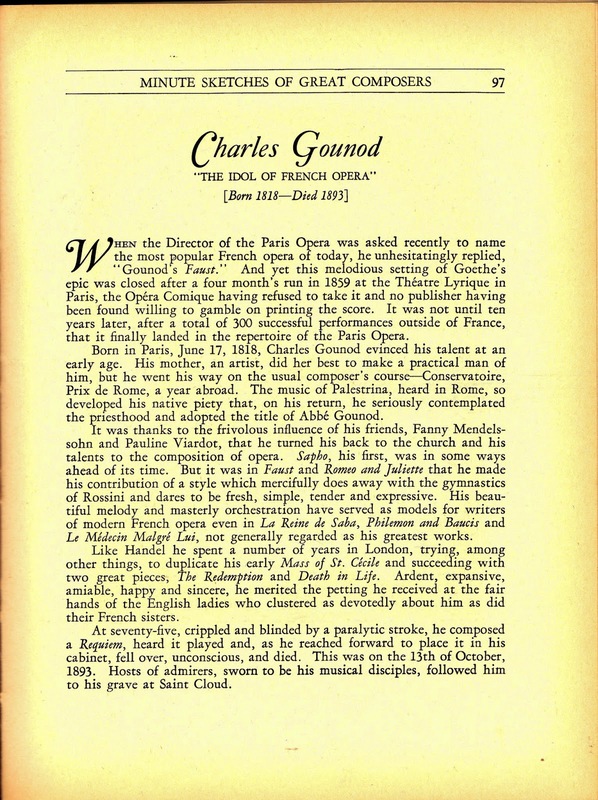 A brief but lively such "story" can be found back in the early 1930s when Grosset and Dunlap offered various books in their Minute Sketches series. The one page composer stories in Minute Sketches of Great Composers were widely enjoyed at the time. The only opposing view I found comes from the Anton Bruckner; Symphony Versions Discography site. The site is compiled and maintained by John F. Berky, who faults the book for being " full of inaccuracies but it is memorable for its dismissive tone and the classic comment about Bruckner, 'shambling along the street in ill-fitting, dusty clothes.' At least the sketch has some redeeming values." I presume he's talking about Samuel Nisenson's illustrations. The entire book is available at Archive.org. It was interesting the people who, unlike Berky, were devoted to the series, especially this book. Dennis Simanaitis in his blog, Simanaitis Says, loves the Art Deco style of the series and its "micro-essays" of under 100 words. The Billie Sucher Blog on April 19, 2010 put the book in a "hope chest" for her adult son. Wildflowers and Marbles.com puts the book at the top of a list of composer resources for home schooling across age and grade levels. Back on April 9, 1938, although the book had been released back in 1932, it was recommended on page 7 of the intriguing pdf of the weekly Radio Guide. It's a '30s forerunner of TV Guide and gives insight into the entertainment industry of the day and the many other programs people invited into their homes back then. Google Scholar also cites the book 15 times with articles from its publication through last year. Additionally I found the book still held in academic libraries. 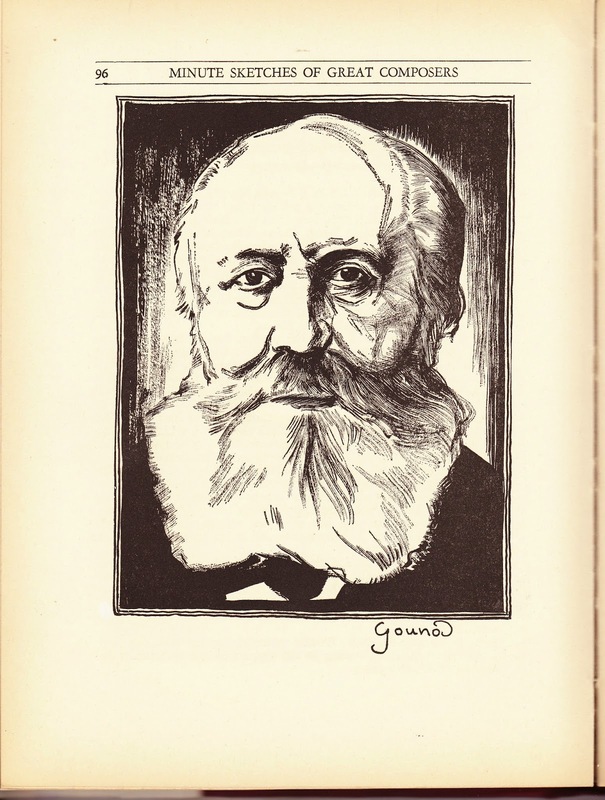 By now I've taken quite a few minutes, but here's Gounod's Minute Sketch. While the Sketch doesn't mention Funeral March of the Marionette, the last two paragraphs, especially about dying upon hearing his Requiem, all seem ironically appropriate. Before we shut the coffin figuratively, here's another interesting link, Limelight magazine's"The 13 strangest composer deaths in classical music" and I love that it was written on a Friday the 13th. They wanted 13, but I would have made sure to include Gounod, especially since he died on the 13th of October, and drop one of the others. Which one? That would be up to the storyteller. 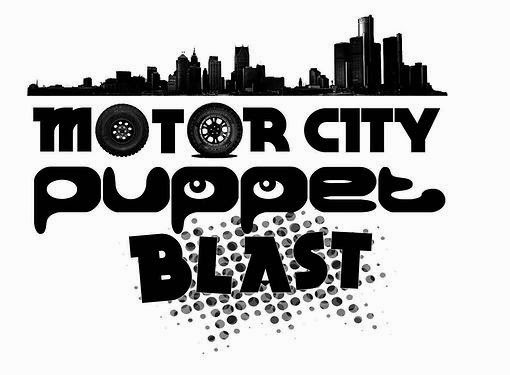 If you can come to the Detroit area any time from July 25 through the 27th, be sure to check out the Motor City Puppet Blast information there, too. Today's musical adventure sounds a bit like my answering machine message where I say "You just never know what I might be up to..."
Of course it will always have something to do with storytelling and often even the Public Domain. A to Z, Puppets Are EASY!